The situation is slightly different in Europe. In the UK, where stock shortages for video game hardware are common, most online retailers are still taking pre-orders but just not guaranteeing shipping for release day. There are no sellers on eBay UK. Amazon Germany has stopped pre-orders whilst Amazon France and Spain continue to take orders (again with no guaranteed shipping date). On September 7th a Sony Conference should see the official announcement of the PS4 "Neo" console which is expected to be essentially a slimmer, slightly more powerful PS4 console. With this, there are likely to be new bundles of the new console and VR headset being released during October and November. As with all these things, only time will tell how severe the stock shortages will be, however it looks like the US could be particularly hit hard. At Stock Informer we will be regularly monitoring the situation with regular updates. 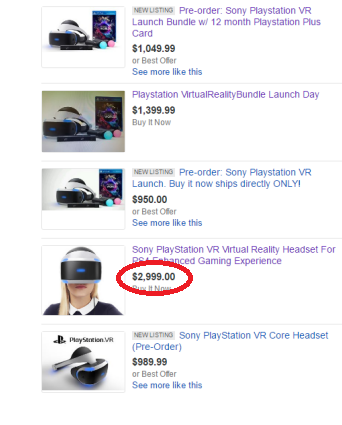 After release we will be constantly checking online stores for stock ensuring you will be the first to know when an opportunity arises to buy a PlayStation VR headset.